South Bend, Indiana is a medium-sized city with a population of 101,037 people. South Bend tends to attract a younger crowd, as the median age of 33 is far below the national average. If you are not a fan of long commutes, you will enjoy living in South Bend. With average one way commute time of only 20 minutes, getting to and from work is a breeze compared to the national average of 26 minutes. Are you trying to decide if living in South Bend is the right fit for your lifestyle? To ensure a good experience before relocating to any new city in Indiana, you will probably want to make sure that you check all of the most important boxes. Using the livability score which includes data from categories like crime, cost of living, weather, education, housing, you can easily compare the best places to live in South Bend and also determine if there are any nearby cities that might be a better match for your lifestyle. You can also compare South Bend to Indiana and the national average. With a livability score of 62/100, South Bend is ranked #21,124 in the United States and #524 in Indiana. 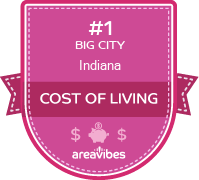 Based on the grades for each individual category, South Bend has been rewarded with high marks for amenities (A+) and cost of living (A-). There are some categories that South Bend ranks poorly for, including: crime (F), weather (D), education (D-), employment (F) and housing (D). It might be worth taking a closer look to figure out why. Location, location, location - possibly the three most important words in your search for a new place to live. Fortunately, in South Bend, there is no shortage of amazing local amenities and interesting things to do. The South Bend unemployment rate (1.25%) has continued to decrease over the years and is now well below the national average. Finding a new job in the area might just be easier than you thought! There are many factors that go into deciding if an area is the right fit for your lifestyle. Certain “must haves” like low crime, great schools and nearby amenities are all at the top of most people's lists. But before even considering if those options are available, most people will need to know if the real estate in South Bend is actually affordable. Median real estate prices in South Bend come in at $80,500, which is 36.4% lower than the Indiana average. The home price to income ratio compares the median home prices to the median household income. In South Bend, the home price to income ratio is 2.3, which is 8% lower than the Indiana average. Real estate appreciation rates in South Bend are important to consider, as they can act as a guide to determine if your new home purchase will be a solid investment going forward. During the last twelve months, the appreciation rate for South Bend homes comes in at 8.7%, and the 5 year appreciation rates were 4.4%. How Do You Rate The Livability In South Bend? The review from 2015 is pretty spot on. I can try to give a 2018 update. There have been some improvements but only in blue collar jobs in Elkhart area and other areas. And in healthcare as always.The main issue is the people here are pretty narrow minded, low class, overly suspicious, political and complexed. And this is from retail to corporate. I can only speculate the reason, maybe it’s a lifetime and culture of dealing with blue collar people which is less professional. 90% of the blue collar people I have dealt with here, whether it’s a plumber coming to my house or a person working at retail, are either pissed at their job or on some strong drugs. Doesn’t seem like a campus town at all. Norte dame is completed integrated in the city and is the most congested in the whole area. Parking there is a nightmare. Only good parts are in the north. Granger, areas around grape road and some districts in north south bend. West and south are really bad and it’s sad to see such derelict houses and people living in such poverty. And Elkhart neighborhoods are really bad too inspite of the projected economic ‘miracle’Weather is bad, nothing much to do here. Looot of old folks here which is why the medical industry thrives here. Drugs and prescription medications are rampant.Speaking of jobs, there is a big discrepancy. Doctors are attracted here for many reasons. On the other side mostly blue collar, minimum wage, odd jobs or lower end secretary administrative type positions. Not much in between. If the mayor wants to get the service industry in, like technology and banking etc and improve the michiana area, he has to deal with and punish companies and employers here who deal in nepotism, favoritism, politics, borderline illegal ways of hiring and firing. This is everywhere in the world but is a bit too much here for no apparent reason other than the bad attitude of the people and the reasons mentioned above. Right now, proffesionals are being pushed out instead of being attracted to this area. Technically not the home of the University of Notre Dame as its address is literally just Notre Dame, IN. While South Bend surrounds the "town" of ND, for decades ND has attempted to isolate itself from South Bend. Since the closing of Studebaker, South Bend has slowly been losing more and more blue collar jobs. As a result South Bend has lost a little less than 25 percent of its population since its peak in the 1960s. In this time Notre Dame has become the largest employer, but make no mistake this is no college town. Until recently the University has wanted nothing to do with South Bend and through its construction of roadways moved all South Bend traffic around it. As it began apparent after the financial crisis of 2008 though, the city was falling apart (homes across the city and office buildings downtown are still in horrible condition, the tallest building in the city is currently completely vacant because it is so badly in need of repairs) and Notre Dame finally started investing in the surrounding area. So since Mayor Pete Buttigieg has taken over, hundreds of homes have been demolished (much more needs to be done) and Notre Dame has subsidized some of its employees to buy new homes that have been built up near the city. The hope is that high-tech companies will be drawn to the university and start-up or move to South Bend to stabilize its economy which at the moment is heavy in the service sector (healthcare and the like). There are also hopes that more people will move downtown and the city has helped in an effort to convert two vacant buildings downtown into apartment buildings. It's up in the air how this will pan out and if South Bend will actually be able to turn itself around. So that's the history and where South Bend stands today in a general sense, so here's the more practical breakdown of the neighborhoods and other things. If you look at crime statistics South Bend is a horrible place to be, but crime is only heavy in certain areas. The west side, basically everything between the toll road (I-80), US 20 and the St Joseph River (this is a large area), and the south side up to Twyckenham Hills are the worst areas of South Bend. Vacant homes all over the place, empty lots and most homes that people are living in are falling apart. River Park is not that great either, but it's better than the south and west side. Also the area between Notre Dame and downtown South Bend used to be bad, it's still not entirely safe, but this is where Notre Dame is pouring its money to make South Bend better. So the new Eddy Street Commons in the Northeast area now have beautiful 500,000+ dollar mansions just down the block from crumbling houses that could be sold for under 50,000. I'm guessing in 10-20 years that whole area will be completely upscale and all the poor will be pushed out. Honestly everywhere else in the city is pretty safe and quiet. The most desired neighborhoods near the city are: Twyckenham Hills, Sunnymede, Coquillard Woods and East Jefferson and Washington area just north of Sunnymede. Neighborhoods to be wary of even though they have nice houses because they are on the edge of crime-infested areas are Edgewater Place and Chapin Park. The education stats are also horrible for South Bend, but like the crime that is exclusively in the public school system. The private schools in South Bend are some of the best in the country. Several have won Blue Ribbons and Trinity School at Greenlawn stands as one of the top high schools in the US with 4 Blue Ribbons, an honor only reached or surpassed by 8 other high schools in the whole country. The weather is another turn off for people. South Bend gets a lot of snow and most people here are so immune to it they don't realize just how much we get. With an average of 67 inches of snow per year South Bend is regularly in the top 10 of snowiest cities in the US. I mention it to people here every once and awhile and it always surprises them. We do not get the fanfare of other lake effect snow areas like Buffalo, Syracuse or Erie (rightfully so), but take a look at the 2014-2015 winter and there is South Bend at number 8 with 83.9 inches. The reason for this is while South Bend gets a lot of snow it is more spread out during the entire winter. We rarely get hit with a foot or two at a time. As I said earlier this is not a college town besides local college bars there are almost no activities to do on a regular basis. Besides food, the Morris Performing Art Center (which isn't that great) and our minor league baseball team the South Bend Cubs (formerly Silverhawks) there is nothing downtown. There are events every so often and Notre Dame does provide interesting things to the public, but it's not much. The main draw for people is that South Bend is very cheap, but that is because there are very few jobs that pay anything. If you have a great salary though, like the suburbs, can afford the private schools and don't need to do something every night South Bend is a fine place to live. You can always spend your weekends in Chicago, less than 2 hours away, or go to the beach during the summer at Lake Michigan (Warren Dunes is the best) which is only 45 minutes away. Even with Notre Dame finally focusing on making South Bend a better place to live, I'm still not too confident South Bend will change much especially if they approve the making of that casino on the south side that everyone seems to be so keen on. And as an aside I strongly disagree with the other reviewer who said, "...this college town boasts an 1850's charm." Nothing could be further from the truth and unless you love Notre Dame there is no reason to visit. I have traveled twice to South Bend, Indiana. Although not my original destination, the town itself proved to be charming despite my reason for being there. During both visits, I stayed at the Ramada Inn. The rooms were clean and comfortable, reasonably priced, and the desk clerks were great. Carriage House Dining Room & Gardens is an excellent choice for dining. The menu at this South Bend restaurant offers plenty of choices, the food is delicious and the restaurant itself was very clean and attractive. Since a majority of the population in the city of South Bend is college students, many excellent restaurants, night clubs and bars are available to choose from. South Bend's roads are horrendous and full of pot holes, but the history of the city is rich and exciting. Home of Notre Dame University, this college town boasts an 1850's charm. The original Studebaker factory still stands in South Bend, along with several stately mansions owned by the Studebaker family. South Bend is also home to a few spooky thrills, including the City Cemetery, featuring some of the oldest graves in the area. Oliver Mansion is also a popular attraction. Supposedly, behind its stone walls, Katherine Oliver's restless spirit can be seen roaming the mansion. Source: The South Bend, IN data and statistics displayed above are derived from the 2016 United States Census Bureau American Community Survey (ACS).